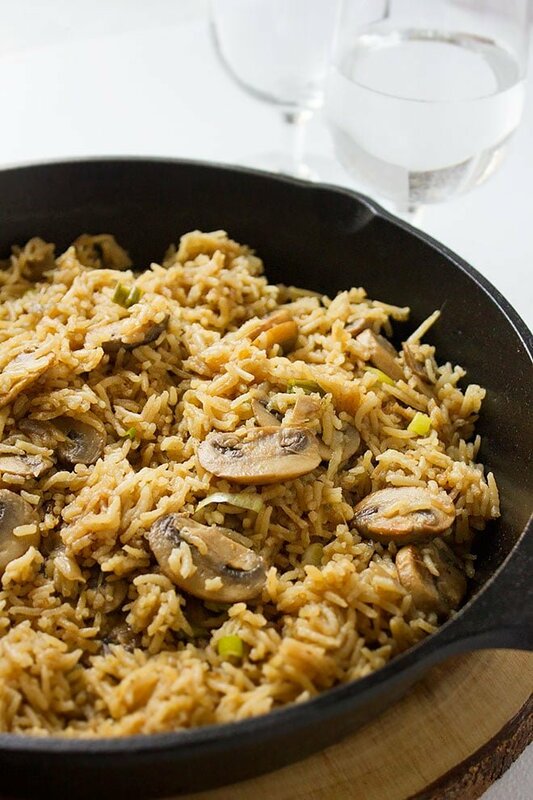 Don’t look at this Mushroom and Rice recipe as a side dish, it’s so delicious you’d eat a lot and will want more. One pot recipe, easy to make and the cleanup is a breeze! I have some great tips to make this delight extra special so keep on reading. If you want the onion to be caramelized quickly, sprinkle a pinch of salt over the sliced onion and mix well. After a minute, pat dry the sliced onion using a paper towel, this will take out most of the moisture in the onion and it will caramelize quickly. Add the onion to the oil only when the oil is hot, otherwise, the onion will turn soggy and will take a longer time to caramelize. Cook the onion on high heat and stir continually to avoid it from getting burnt. Use a damp kitchen towel or paper towel to clean the mushrooms. Washing the mushrooms with water will not allow it to caramelize properly and will not have a meaty texture. 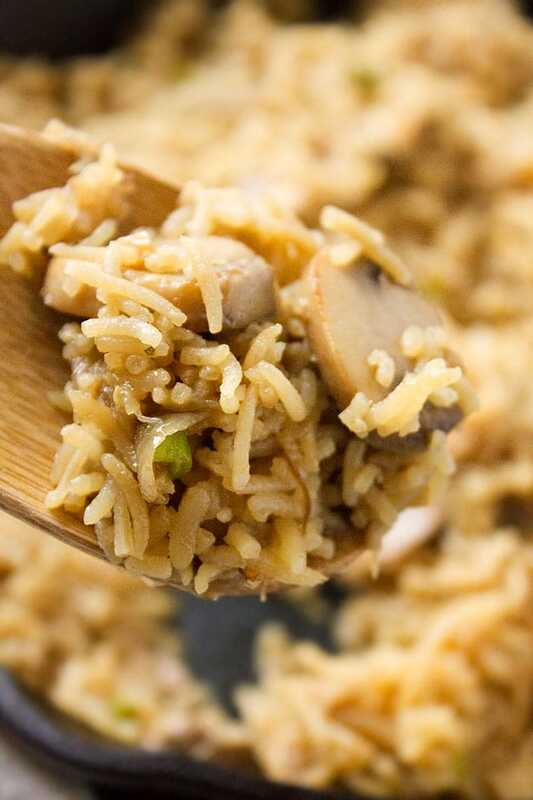 Soak the rice in warm water for 20 minutes, this step reduces the cooking time and the rice won’t stick together. 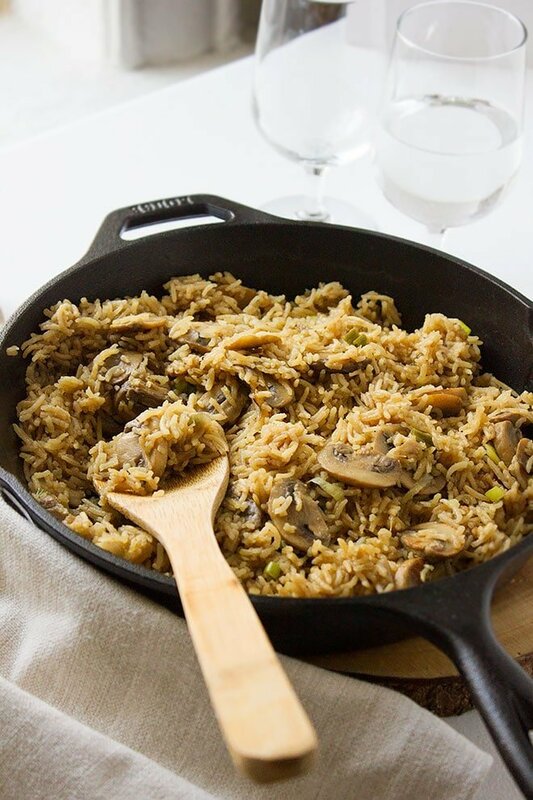 Mushroom and rice is a perfect side dish, and you can serve it with your favorite juicy steak, or baked chicken breast. In my house, we enjoy it with some salad on the side. This dish is not only filling but have great flavor. The mushroom is cooked perfectly and have a meaty texture, you’ll never miss the meat. I have used button mushrooms, but you can use any type available to you. I have made another vegetarian dish that you might find interesting, it is called Mujadara, it is another vegetarian dish that I love so much and enjoy at least one time a week. 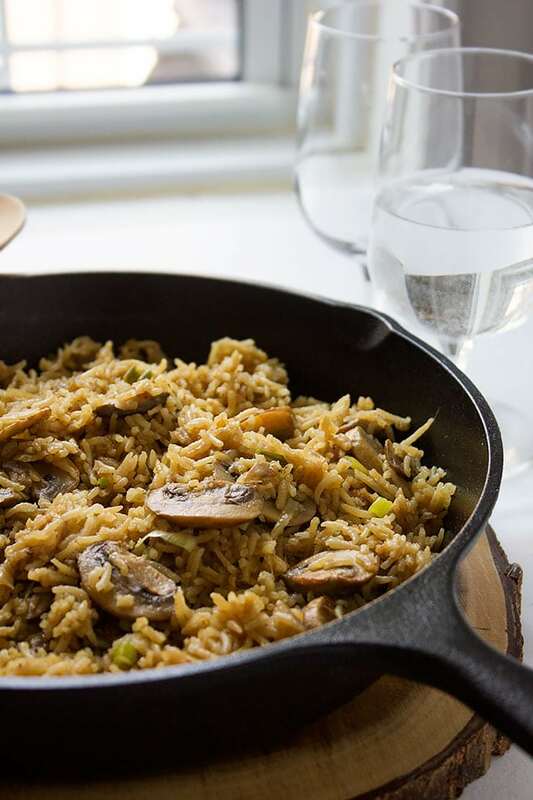 If you have mushrooms and wondering what to make for dinner, look no further, run to the kitchen and make this outstanding mushroom and rice. Let’s make Mushroom and Rice! 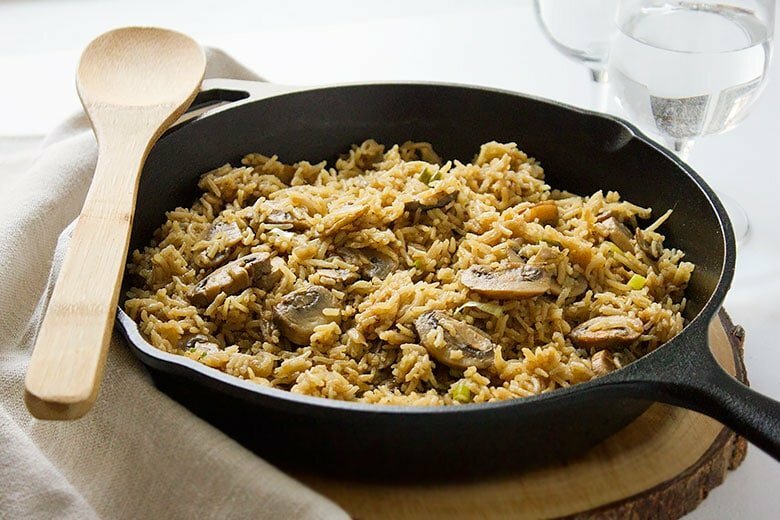 Cooked in one pot, this vegetarian mushroom and rice recipe is so delicious you will never miss the meat. Perfect side dish or with salad on the side it is a great main meal. In a pan, add the olive oil and when hot add the onion and cook on high heat until light brown. Add the mushrooms and cook until both the onion and the mushrooms are caramelized. Add the salt and black pepper and garlic and sauté for two minutes on medium heat. Add the crumbled chicken or vegetable bouillon. Pour the water and let it come to a boil. Add the drained rice and let it come to a boil again. Now reduce the heat to lowest, cover the pan, and allow the rice to cook for 15 minutes. Uncover the pan and add the chopped green onion to the mixture and stir carefully, cover and let cook for another 10 minutes. 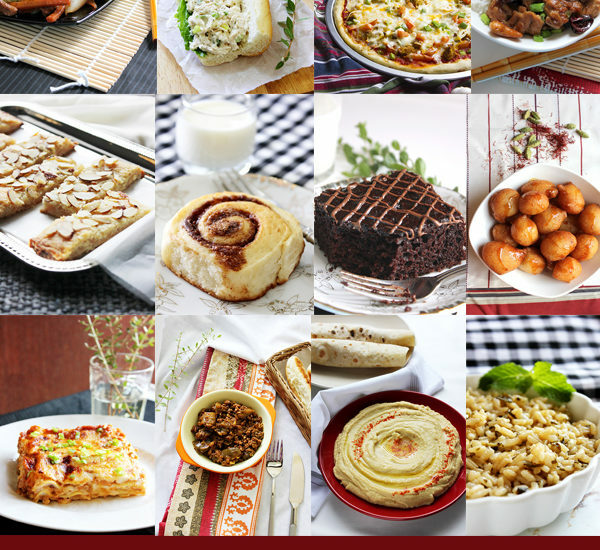 Serve hot with your favorite salad, or you can have it as a side dish with a juicy steak!